Western blot analysis of extracts from cells expressing various activated tyrosine kinase proteins, using Phospho-c-Abl (Tyr412) (247C7 ) Rabbit mAb (upper) or Phospho-Tyrosine mAb (P-Tyr-100) #9411 (lower). 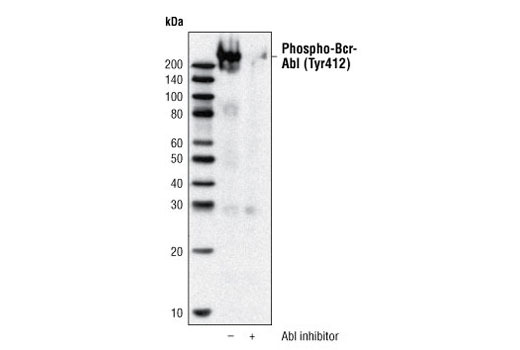 Phospho-c-Abl (Tyr412) (247C7 ) Rabbit mAb specifically recognizes the activated Abl of Bcr-Abl fusion proteins, whose phosphorylation was abolished by calf intestinal phosphatase (CIP) treatment. Western blot analysis of extracts from K562 cells, untreated or treated with an Abl inhibitor, using Phospho-c-Abl (Tyr412) (247C7) Rabbit mAb. Phospho-c-Abl (Tyr412) (247C7) Rabbit mAb detects endogenous Abl proteins only when phosphorylated at tyrosine 412. 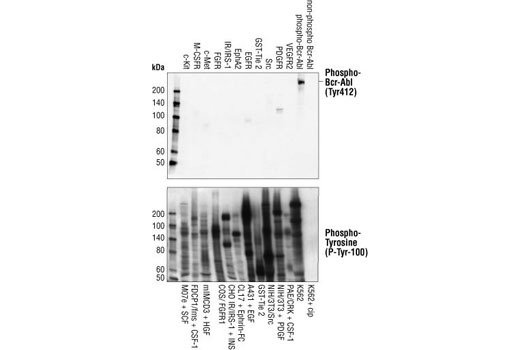 The antibody does not cross-react with other phosphorylated tyrosine kinases. Monoclonal antibody is produced by immunizing animals with a synthetic phosphopeptide corresponding to residues surrounding Tyr412 of human c-Abl.